Your dog will be oozing team spirit in this cute and festive cheerleading outfit! We love the realistic pleated skirt on this cheerleader uniform. 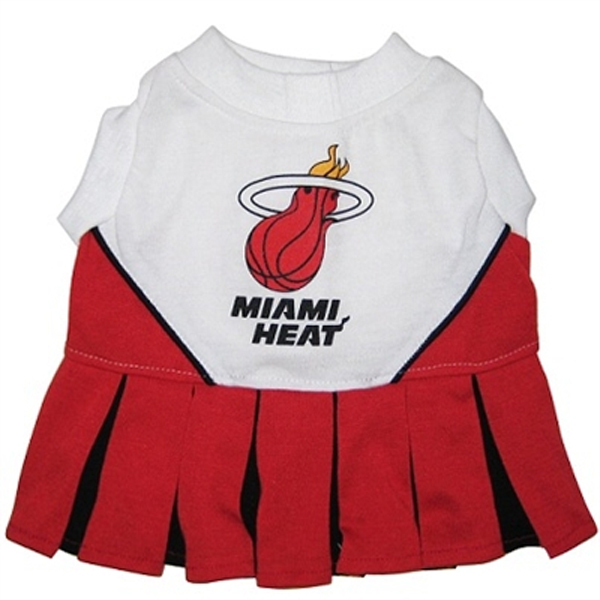 The Miami Heat Cheerleader Dog Dress is a red, black and white dress that features the Miami insignia and Heat emblem across the back. 100% polyester, this cheerleading dress includes a touch fastener closure and high-cut, stay-dry belly for convenience. Posted On 10/21/15 by Wendy P from Juno Beach, FL Yes, Wendy P recommends this product! This is the cutest little dress for my small puppy. The order came really fast and the quality of the item is very good. This dress is sure to impress all HEAT fans. I love this site! They have an abundance of items to choose from and all are of very high quality.